A new Emory clinical trials website includes easy-to-access information about nearly 1,000 clinical trials currently seeking volunteers. At clinicaltrials.emory.edu, potential participants may easily search for trials related to a specific health condition, or browse topic areas such as cardiology, cancer, or the neurosciences and view quick facts about each of the individual trials available at Emory. The new website is available to the entire Emory community as well as to interested external participants. Although many clinical trials are seeking patients who have a particular disease, many others are seeking healthy volunteers. Healthy volunteers may participate in clinical trials to help current and future patients and to contribute to new medical knowledge. Current patients may participate in order to potentially benefit from an investigational treatment, and to help others in the future. Clinical trials are developed and sponsored by different organizations, including Emory and its investigators, pharmaceutical companies, the National Institutes of Health, the Centers for Disease Control and Prevention, or other federal agencies. Participation in a clinical trial is completely voluntary. Each clinical trial at Emory is reviewed rigorously by an Institutional Review Board (IRB) to protect the rights, safety, and welfare of participants. A principal investigator leads each clinical trial, along with a research team. Information about each clinical trial includes its purpose, timing, investigators, process, and certain key eligibility criteria. Potential volunteers may click on a link to the leader of each individual trial and send a message asking to participate or requesting additional information. A link to the NIH clinical trials database — clinicaltrials.gov — is available for those seeking more detailed information. 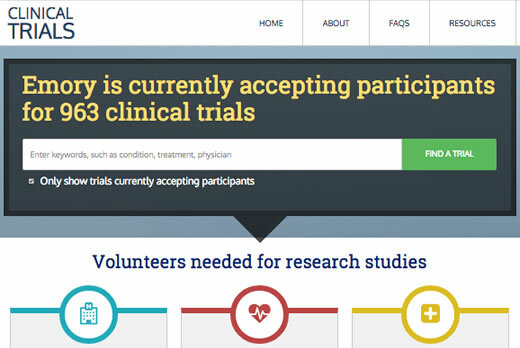 The clinical trials website also includes frequently asked questions about volunteering, information on additional resources at Emory for potential participants, and National Institutes of Health information about clinical trials. Individuals also may register through ResearchMatch.org, a national database that connects potential volunteers to new clinical trials seeking volunteers.